Rampart Blu-ray Review. 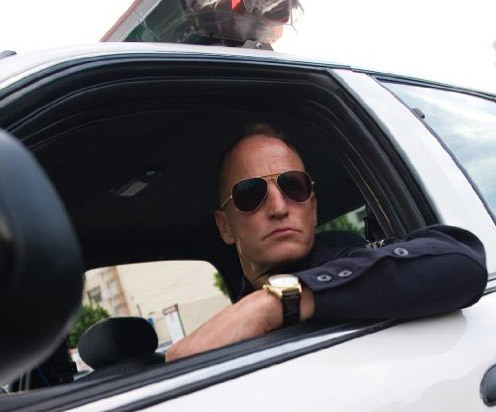 Worth picking up for Harrelson’s performance alone, Rampart is, despite its flaws, an interesting take on the familiar corrupt cop tale and the ramifications that come with living above the law. 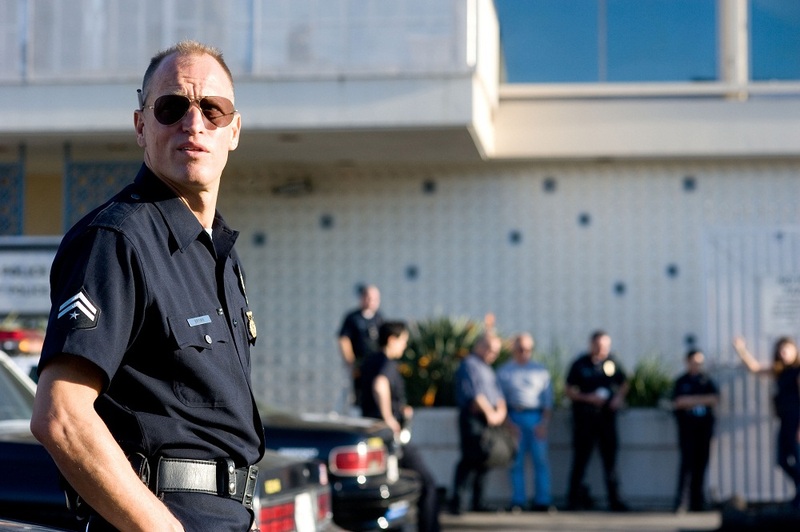 Set amongst the backdrop of the Rampart Scandal of the late Nineties, where over seventy officers of the LAPD were implicated in widespread corruption claims, Oren Moverman brings us what is essentially a character study of a corrupt officer who suffers from the political and societal fallout of the scandal’s aftermath, despite not being directly involved. Based on a script by renowned crime writer James Ellroy, Rampart reunites Moverman with the star of his earlier feature ‘The Messenger’, the always mercurial Woody Harrelson. 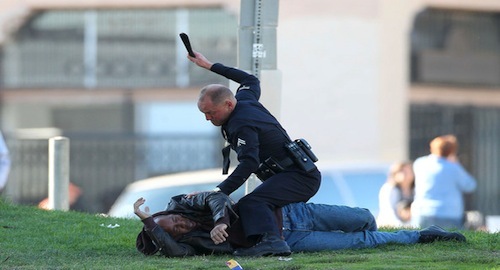 Together they take us into the world of Dave Brown, an officer in a city where racial tensions simmer and public opinion of law enforcement is at an all time low due to the aforementioned scandal and the Rodney King case. Used to straddling the line of legality, Brown is an arrogant, misogynistic, womanising misanthrope with a home life as unorthodox as his methods of serving the peace; living in a flat out the back of a property where his two ex-wives reside, who also happen to be sisters with a child each to him, the tension in both aspects of his life is absolutely palpable. Everything comes to a head when Dave is filmed assaulting an ethnic minority and the image is broadcast across the country. Suddenly, Dave’s violent history and methods come under intense scrutiny and his life begins to unravel. With hand held cameras nowhere near as prevalent in Ninety-Nine, the question is raised as to whether Dave was set up by someone who knew of his volatile nature, possibly to detract attention from the besieged Rampart police department and the scandal it’s currently embroiled in. Woody’s acting is a revelation and a definite highpoint in his career. He imbues the character with an underlying menace and intensity that is evident at all times. Supported by a phenomenal - Albeit generally underused - cast, he manages to blow everyone else out of the water. Make no mistake, this is Harrelson’s film. Unfortunately, the film itself is beneath the calibre of Harrelson’s performance, which is a real shame. It lacks cohesion, with a meandering plot and disjointed scenes strung together in a daisy chain of contrasting visual styles that don’t really mesh. With a Cinéma vérité handheld style at odds with overly artsy and symbolic shots, it’s almost as if the director was unsure of what kind of film he wanted to make. The basic story is interesting enough, if nothing new, but the editing, pacing and self indulgent direction really serve to detract from Harrelson’s mesmerising performance. Despite the gritty cinematography, Rampart has an impressively sharp transfer that reveals a variety of fine detail, such as pores, hair and textures. The colours are vibrant, with no sign of bleed. Greater still is the quality of darker scenes, such as the nightclub scene, which is awash in beautiful red lighting that contrasts nicely with the black levels. There is a small amount of noise in some scenes and I noticed aliasing on a fence, but generally the transfer is brilliant. The Dolby TrueHD 5.1 is just as impressive, with ambient noise and the sounds of Dave’s surroundings presented with crystal clear precision. Dialogue can be a bit hit and miss, with levels appearing slightly off during some scenes, such as the dinner table conversation. With a decent system, dialogue will play through the centre channel and doesn’t get lost in the mix, but when using a two channel system, certain scenes can be difficult to hear, even after adjusting the audio output settings. Overall though, the Audio is handled rather well. Features include a comprehensive making of featurette that covers the Rampart Scandal, shooting schedules, lighting and cinematography choices and more; quite informative, it manages to hold your attention for the entire duration and is greatly recommended, even if it does at times come off as a bit of a puff piece. Also included are a trailer and a series of promotional interviews with the cast and Director. Rampart is, at its core, a portrayal of a man slowly falling apart, desperately trying to cling on to his archaic way of life and failing spectacularly at it. He’s a remnant of a bygone era, rendered obsolete by the shifting perceptions of society; He slowly comes to the realisation that he lives in a house full of women who hate his misogynistic ways and dogged attempts at controlling their lives. He doesn’t realise that his way of looking at the world just doesn’t work anymore - Like a man with a handful of sand, the harder he tries to hold on, the more it slips through his fingers. Ironically, the character of Dave Brown, if the film was made thirty years ago, would embody the essence of the archetypical hero, much like ‘Dirty Harry’- A tough cop dealing his own brand of justice in his own way, never taking no for an answer and bedding every woman in sight. The film serves to highlight that our standards of heroism and authority are constantly changing - The angry hero with a badge and a gun is merely a facade that hides insecurity and loneliness. Harrelson conveys this and more in a multifaceted performance that cements his status as one of the best actors working today. 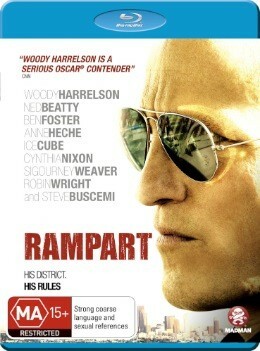 Worth picking up for Harrelson’s performance alone, Rampart is, despite its flaws, an interesting take on the familiar corrupt cop tale and the ramifications that come with living above the law.